I have written several times before about how much I enjoy lending people money on the peer-to-peer (P2P) loan website, Lending Club. Of course, I am not just lending out my hard earned money from the goodness of my heart. I am earning a great return on my investment. My current average annual return on my portfolio of loans is 15.39%. And, I do not need to tell you what a great return that is in today’s crazy market where investing has been a roller coaster lately. So, I wanted to share with your some of my strict lending requirements when I look for loans to make. For those of you who are not familiar with Lending Club, there are usually about 180 loans on the website at any given time waiting for lenders like you and me to come along and fund them. And, you can search through them all by several criteria. 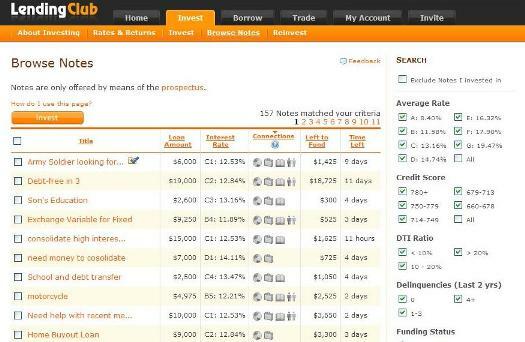 Below is a screen capture of Lending Club’s current loans available to invest in. My personal loan criteria are…. I only look for loans with a risk rating of “C” or worse. Lending Club does a great job ranking the risks associated with its loans. The average interest rates you earn for each ranking are A: 8.40%, B: 11.58%, C: 13.16%, D: 14.74%, E: 16.32%, F: 17.90%, and G: 19.47%. Requesters have to have zero delinquencies on their debts in the past two years. Lending Club pulls their credit report for lenders to see certain aspects. I like to see people asking for a loan who have longevity at their current job of a couple of years. I give priority to people who have a mortgage as opposed to renters. I like to fund small to medium size loans between $5,000 and $10,000. Anyone asking for over $20,000 will not get my money. The monthly payments are just too huge (Lending Club requires repayment within 3 years or less). I like to look for a low revolving credit utilization ratio. Someone who is almost maxed out on their credit limit might be squeezed very tight to pay you back at Lending Club. I also prefer to lend to entrepreneurs instead of regular consumers just trying to consolidate their debt. I only loan either $25 or $50 per loan. Many people loan more money than that to a single person, but by keeping the amounts that I loan small to each person, I hedge my risk of one default ruining my entire loan portfolio. Many investors I have talked to only prefer to invest in loans to Lending Club patrons with the risk grades of A and B only. That is awfully conservative. I do not bother looking at A’s or B’s at all. The whole reason that I am a lender with Lending Club is to earn a high return while mitigating my risk using a lot of the other criteria mentioned above. I am huge fan of Lending Club if you haven’t figured that out already and have really enjoyed the great rate of return that I am getting. I have used their service for about six months now. Now, the company offers automatic funding every month from your checking account. So, I have them transfer $50 every month for me to loan to other people. By keeping these criteria or any other criteria that is important to you in mind when you are making loans on Lending Club, you can mitigate the risk of a loan defaulting and you can keep earning some great rates of return. Excellent criteria. I’m just now getting into p2p. Will have to bookmark this one. Did you mean C or better?